If you have gum disease, you’re certainly not the only one. In fact, you’re among the majority of American adults dealing with bleeding, tender gums and persistent bad breath. But how much do you really know about the condition? Take some time to read through Dr. Mark Makram’s FAQ with everything you need to know about gum disease in Naples. A: In the beginning stages, gum disease is characterized by red, tender gums. You will probably notice they bleed when you brush and floss. Bad breath is also common with gum disease — that happens because there’s bacteria going crazy in your mouth. As the condition progresses, you will experience gum recession, tooth sensitivity, and maybe loose teeth. Periodontal disease eventually causes tooth loss and diminished volume of the jaw bone. A: Gum disease is most often caused by poor dental hygiene. When people skip out on proper brushing and flossing every day, food particles and bacteria are left behind to multiply out of control and create an infection between the gums and teeth. Additionally, tobacco use and insufficient nutrition can contribute to gum disease. Q: Who gets gum disease? A: Anyone can suffer from gum disease, but the condition is most common in patients who are over the age of 35. After 55, the risk dramatically increases. Gum disease affects men and women equally. Q: What are the consequences of gum disease? A: When left untreated, gum disease causes the jawbone to lose its volume and eventually leads to tooth loss. The condition has also been linked to serious health problems, including heart disease, respiratory issues, high blood glucose levels, and even dementia and memory loss. Q: How do you treat gum disease? A: Gum disease treatment depends on the severity of infection. In the beginning stages, infections in the gums can be reversed with improved dental hygiene at home and additional visits to our office. After the disease progresses, scaling and root planing is a deep cleaning that removes bacteria from around and below the gum line, then smoothes the tooth’s root to reduce inflammation and prevent the risk of reinfection. An antibiotic can provide additional help for full healing. Periodontal disease in its latest stages may require surgical treatment. A: Gum disease is easy to prevent with good dental hygiene habits, including regular brushing and flossing. Brush your teeth for two minutes, twice a day — invest in an electric toothbrush to ensure you are getting a full clean. Floss daily and visit your dentist every six months for preventive care. 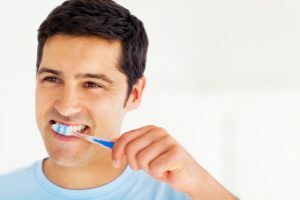 We will check in on the health of your gums and give you specific advice for how to maintain effective dental hygiene. If it’s been awhile since you visited the dentist, or if you suspect that you are dealing with gum disease, don’t wait to schedule an appointment with Dr. Makram! We provide superior preventive care to help you avoid periodontal conditions, as well as the therapeutic treatments you need to renew your oral health.